For much of the United States, Detroit has become shorthand for failure--not just because of the dilapidation of the town’s iconic industry, but because the entire metropolis seems like a dystopian disaster. It is the second-most-segregated metropolitan area in the country; the city’s population is 82 percent African American. No other American city has shed more people since 1950--Detroit is only half its former size. Its city government fails at the most basic tasks. A call to 911 will bring a response, on average, in about 20 minutes. (Such emergency calls are depressingly common in the metropolitan area: There are 1,220 violent crimes per 100,000 people.) And that’s to say nothing of corruption in the municipal ranks. This year alone, at least 48 Detroit public-school employees have been investigated for fraud--which might help explain why only one in four high school freshmen ever receives a diploma. Unemployment in Detroit stands at a staggering 28 percent. And, in key measures of economic vitality in the nation’s 100 largest metropolitan regions, Detroit finishes dead last. Take Belfast, which suffered not only industrial decline and disinvestment, but also paralyzing religious guerrilla warfare. Although it received the same sort of hammer blow from globalization as Detroit, it now has steady job growth after decades of losses. Its economic output leapt 35 percent per capita between 2000 and 2005. And, throughout the European continent’s industrial belt--the parts that are distinctly not Disneyland for American yuppies--there are many other examples of old redoubts of manufacturing (Bilbao, Leipzig, Sheffield, St. Étienne) that have enjoyed the very same sort of dramatic recoveries. This is not to oversell the optimism that these cities should inspire. They will never recover their full manufacturing might or swell with quite so many residents as before. Still, they represent realistic models for the rescue of Detroit. It is strangely fitting that the recent auto bailout endowed Detroit with a new corporate patron hailing from Turin, Italy. Like Detroit, Turin was once a grand capital of the auto industry, which accounted for 80 percent of the city’s industrial activity, most of it with Fiat, Chrysler’s new owner. But the Italian auto industry didn’t fare much better than the American one in the face of new competition. Fiat’s Turin operations went from 140,000 workers in the early 1970s to a mere 40,000 in the early ’90s. And with the collapse of Fiat came the collapse of Turin. Its population plummeted almost 30 percent in 25 years. National and local leaders focused more on combating domestic terrorism from the Red Brigades than on providing basic services. The city spun through four mayors in seven years and accumulated a budget deficit in the mid-’90s of 120 billion lira. Recovery from this kind of spiral begins with political leadership. And, in 1993, the city elected a reformist mayor, Valentino Castellani, who devised a breathtakingly ambitious plan for the city. Potential investors were never going to have faith in Turin unless the city spelled out its strategy with specificity, so the plan laid out 84 “actions” for development, which Turin vowed to implement by the year 2011. Despite its gritty condition, the city promised to develop a tourism industry and the transportation network to support it. It used its own funds, plus money from national, regional, and provincial governments and private companies, to create a range of institutions--business incubators, foundations, research laboratories, venture-capital funds, and technology parks--that would promote its information-technology and green-energy industries. Other efforts built on Turin’s historical strengths. Turin may no longer have had cheap industrial labor, but it still possessed people with a deep understanding of production and design. They simply needed new outlets and markets for their core competencies. Turin’s plan worked. By 2006, it posted its lowest levels of unemployment ever and its highest levels of economic activity in half a century. The city reinvented itself as a center for design, not just of cars, but also for aerospace, cinematography, and textiles. Plenty of parts suppliers still depend on business from Fiat, but they have also found new customers in China and other growing markets. Physical regeneration accompanied the economic recovery. The city submerged the old central railway line that had bifurcated the town, transforming that route into a boulevard that serves as Turin’s new backbone. What Turin shows is that even a decaying industrial base can be the foundation for a new economy. That is, the industry may fade, but expertise doesn’t. Detroit’s American cousins, Akron and Toledo, have already shown how specialties developed for car manufacturing can be repurposed. As Akron’s tire-making industry declined, companies, working with local universities, shifted their focus and research efforts into the related business of polymers. The former Rubber Capital of the World now makes polymers and plastics that can be used in clean energy and biotech. Or take Toledo, which long specialized in building windows and windshields for cars. One industry leader, known locally as “the glass genius,” started tinkering with solar cells in the 1980s. The University of Toledo showed an interest in his work, and the state gave the school and two companies some money to investigate photovoltaic technology. That spurred other business and university collaborations, which drew more infusions of state economic development funds, and the region now has some 5,000 jobs in the solar industry. Institutions developed at the height of Detroit’s postwar prosperity remain--and provide the city with advantages that similarly depressed industrial cities cannot claim. It has educational institutions in or near the city (the University of Michigan, Wayne State) and medical institutions (in part, a legacy of all those union health care plans) that are innovative powerhouses and that currently generate private-sector activity in biomedicine, information technology, and health care management. And there is already a smattering of examples of old industrial outposts that have reacquired relevance. An old GM plant in Wixom has been retrofitted to produce advanced batteries. There’s a new automotive-design lab based in Ann Arbor. And Ford, the most promising of the Big Three, has made a decisive shift toward smaller, cleaner cars. Retooling Detroit’s old industries and advancing its new ones will take public money, and the feds are the only ones with money to give these days. But Washington already spends heavily on Detroit--$18.4 billion went to the city and the surrounding county in 2008. This money, however, isn’t invested with any broader purpose, a sense of how all this spending can add up to something grander. A better return on federal investments will take a functioning local government as well as leadership in suburban counties that is willing to collaborate closely with the city. And, with so much sclerosis, change will only emerge with a strong hand from above. State and federal governments should place the city’s most dysfunctional agencies in receivership as a quid pro quo for federal investment--a milder version of the federal takeover of Washington, D.C., in the 1990s. These higher-level governments should also insist that the city and its suburbs end their wasteful bickering and act as one on issues that naturally cross borders, like transportation and the environment. The region’s elected officials should be strongly encouraged to replicate the metropolitan mayors’ caucuses in Chicago and Denver, or a strong metropolitan transportation and land-use agency, as in Portland or Minneapolis. Business will never have faith in Detroit with local government in its current condition and with the metropolis so riven by old city-suburb divisions. The point of Turin is that dramatic reform in local and metropolitan governance, coupled with strategic interventions from above, catalyzes market revival. Turin reoriented manufacturing with smart, subtle, and relatively minimal government interventions. And there are plenty of opportunities like this in Detroit. The metropolitan region is packed with companies that supplied parts to the Big Three. Because of the current credit desert, these companies should receive low-interest loans that allow them to reconfigure their plants to produce parts that can be sold to the international auto market--or for other types of machinery. And local government (or NGOs, even) can play the role of industrial planner. That is, they can look across the map and find instances where research institutions and manufacturers should collaborate on new ventures. 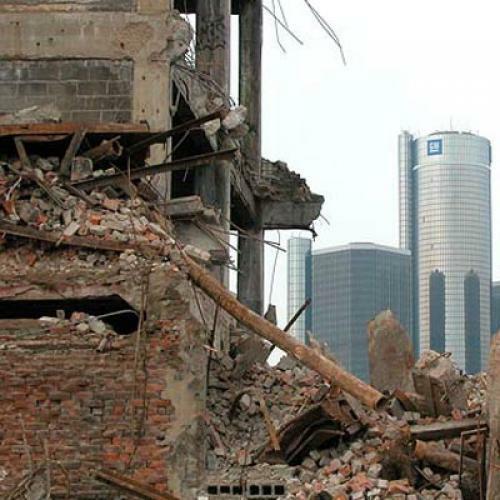 Even if Detroit were to rebuild its economy, it would still face a fundamental obstacle to recovery. It is just too big for itself, with a landscape that even locals compare to postwar Dresden. Nearly one-third of the land in the city is empty or unused, and some 80,000 city homes are vacant. European cities faced a similar challenge. After decades of population and job loss, they were saddled with an excess of housing and too much unproductive, polluted, or vacant land. This derelict land was as much an economic problem as a physical one, depressing property values and repelling new investments. So these cities reconfigured themselves into denser communities, recycling polluted industrial lands, laying down new rail and transit infrastructure, and investing in projects that created demand not only for particular parcels, but also for the wider urban area. This physical regeneration, much more than economic reorientation, is where governments have a major role. The great object lesson is Bilbao, Spain. As in Turin, leaders--in this case, the Basque regional government, worried about the condition of its largest city--created a master plan and two public-private agencies to support it, one of which, Bilbao Ria, focused specifically on managing large-scale land-cleanup-and-revitalization projects. The master plan identified four swaths of the city for targeted reinvention, including a major parcel of riverfront land, which was cut off from the central city by unused shipping and transportation infrastructure. Bilbao Ria spent 184 million euros on site cleanup; the provincial and regional governments kicked in 144 million euros--the full cost--for the Frank Gehry–designed Guggenheim museum. But the city also created a new metro system and a tram line for the revitalized waterfront. Airports, ports, and regional train systems were also modernized. And, critically, the city spent two decades and one billion euros (mostly from higher levels of government) on a new water-sanitation system to keep untreated household and industrial waste out of the river, which would make waterfront development possible. Detroit has to change physically because it simply cannot sustain its current form. It was built for two million people, not the 900,000 that live there today. Manhattan, San Francisco, and Boston could all fit within Detroit’s 139-square-mile boundary, and there would still be 20 square miles to spare. Even more than its European counterparts, which had much less severe population losses, Detroit will have to become a different kind of city, one that challenges our idea of what a city is supposed to look like, and what happens within its boundaries. The new Detroit might be a patchwork of newly dense neighborhoods, large and small urban gardens, art installations, and old factories transformed into adventure parks. The new Detroit could have a park, much like Washington’s Rock Creek Park, centered around a creek on its western edge, and a system of canals from the eastern corner of the city to Belle Isle in the south. The city has already started on the restoration of the Detroit River waterfront, largely bankrolled by private philanthropy. The city has created a new “land bank,” which can take control of vacant and derelict properties and start the process of clearing land, remediating environmental contamination, and figuring out what to do next with the parcel, whether that’s making it into a small park, deeding it to a neighbor to create a well-tended yard, or assembling large tracts of land for redevelopment or permanent green space. There are plans for a new transit line along Woodward Corridor, which, if coupled with smart land use and zoning changes, could spark an entirely different pattern of development. Expanded commuter-rail service to Ann Arbor is in the works, and the Obama administration is weighing a high-speed-rail plan that would link Detroit to Chicago and other Midwestern cities. Like a neglected brownstone or a ramshackle Victorian, Detroit has good bones. Already, the city is attracting social entrepreneurs who are excited by the challenge of fundamentally remaking a city. Philanthropies are pouring in money and imagination--the rail system on the Woodward Corridor is partially funded by tens of millions of dollars from two major foundations, and other philanthropies are trying to develop a comprehensive educational plan. The federal government could support the physical regeneration of Detroit by footing the bill for the development of a new city plan focused on reconfiguring land uses and economic activity around the reality of population loss. More radically, the feds could overhaul that tired cliché of urban policy: the community-development block grant. They should require Detroit and other cities to use these grants (and other federal, state, and local resources) for reclaiming, reconfiguring, and reusing vacant and abandoned land and housing. The federal government could make Detroit a pilot city for land recycling and demolition projects. Scores of other industrial cities have too much land and outdated infrastructure. The foreclosure-smacked boomtowns of the sunbelt are also grappling with their own version of this legacy of excess. European leaders understood that recovery requires at least a generation. This is a tough realization in places that are not just in economic decline, but are often caught in a kind of mass state of depression. Detroit’s leaders must manage expectations. It took half a century for the city to get this low. It won’t turn around in a four-year political cycle. Turin’s revival started with the mayoral election of 1993; Bilbao’s physical transformation began in 1990. And both cities are still in the process of recovery. The policies that salvaged these cities are perfectly compatible with the American grain of politics--but the patience required for their success is not. Washington has already bailed out Detroit--at least, the companies that once turned the city into the quintessential American metropolis of the industrial age. When the government justified injecting money into the firms, it made an implicit argument about the country--that these companies are essential to our future economic greatness, that their loss would be an unbearable symbolic defeat. The same holds for the city that houses them. Even after losing one million people, Detroit is still the eleventh-largest city in the country and, before the auto crisis, it was the source of more than half of Michigan’s GDP. To allow Detroit to continue its march toward death would come at significant costs, both human and economic. For Detroit to die, especially in the face of such tested methods for saving cities, would be an American tragedy. Bruce Katz is director of the Metropolitan Policy Program at the Brookings Institution. Jennifer Bradley is a senior research associate with the Metropolitan Policy Program. This essay draws on research undertaken by Brookings and the London School of Economics for a joint project on older industrial cities.